Every bride-to-be has a vision of the perfect wedding day. Yet common wedding mishaps abound from missing photographers and toppled cakes to embarrassing color surprises. Wouldn't it be nice to strike one potential misfortune from the list? Brides work meticulously to match their wedding colors - from bridesmaid dresses and shoes to flowers and invitations - but oftentimes, it just doesn't come out right. The Dessy Group, a leading manufacturer of bridesmaid's dresses and bridal apparel, and Pantone LLC, an X-Rite company and the global authority on color and provider of professional color standards for the design industries, today announced PANTONE WEDDING exclusively from Dessy. PANTONE WEDDING is a collection of color tools that make it easy for a bride to achieve a perfectly color-coordinated wedding - from inspiration to "I do." "Coordinating wedding colors can be a challenge for brides who are often frustrated by the lack of color tools to help in the planning process," explained Alan Dessy, chief executive officer of The Dessy Group. "PANTONE WEDDING lets brides communicate their exact color choices to wedding vendors and members of the wedding party accurately and instantly." PANTONE WEDDING includes perfectly matched paper swatch cards that can be used on their own, or in combination with Dessy's popular fabric swatches, to communicate wedding colors - from bridesmaid and flower girl dresses, accessories and menswear to flowers, invitations and tabletop designs. PANTONE WEDDING paper swatch cards are available in over 200 PANTONE WEDDING Colors for the spring 2010 season. Each full-size, 8 ½-by-11 inch, swatch card can be divided into 14 individual 4 ¼-by-1 ½-inch swatches for simple sharing. Brides can send swatches to family members, bridesmaids and wedding vendors, and still have one to keep in their wallet for last minute color decisions. "For over 45 years, Pantone has been the source for inspiration and professional color standards for the design community worldwide. With the creation of PANTONE WEDDING, we are extending our professional expertise to the bridal market and giving every Dessy bride-to-be the color tools she needs to confidently coordinate and communicate her color choices," said Laurie Pressman, vice president of Pantone's fashion, home and interiors division. "Color is the single most important design element in reflecting mood and style, and with PANTONE WEDDING, the Dessy bride can easily express her creative vision for that all-important day." To make color selection and coordination even easier, the Dessy Web site will also feature a special section dedicated to PANTONE WEDDING. 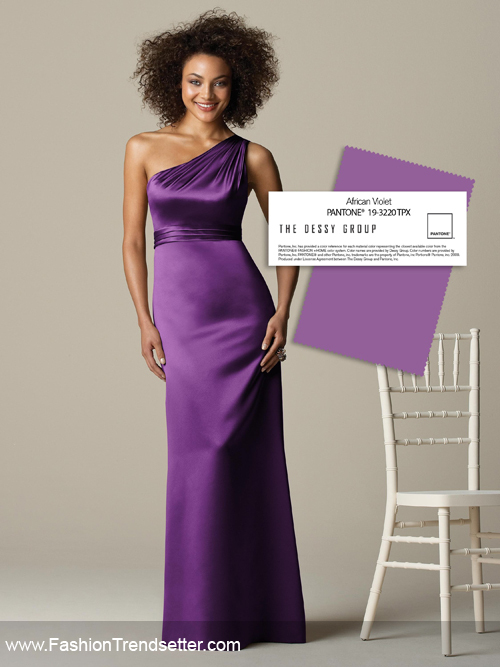 The site, www.dessy.com/PANTONE, features new interactive tools, including inspirational Style Boards, to help brides choose their wedding colors and accompanying bridal apparel. To create the perfect Style Board, brides can browse over 200 PANTONE WEDDING Colors, select from all Dessy bridal apparel and accessories or import wedding and inspirational images from the Web. Images can be dragged and dropped, sized and rotated, as well as moved front to back and back to front. Once a Style Board is created, it can be saved for later viewing and editing. Brides can send completed Style Boards to others via email using the "tell a friend feature." HTML-embed codes are also available so that brides-to-be can publish their Style Board to wedding Web sites and blogs. Each Dessy product in a saved Style Board will link to the product details page so that brides and attendants can easily find and purchase items. The PANTONE WEDDING paper swatch cards are available this fall for the complete range of colors in all dress collections by The Dessy Group, including Dessy Collection, Lela Rose, After Six and Alfred Sung. The 8 ½-by-11 inch full- size paper swatch cards can be cut into 14 individual swatches and will be available in over 200 PANTONE WEDDING Colors for the spring 2010 season. PANTONE WEDDING paper swatch cards are available at www.dessy.com/PANTONE for U.S. $10. A special bundle price will also be available, offering full size paper swatches with Dessy fabric swatches. Individual fabric swatches are available in 6-by-6 inch swatches or by the ½ yard and range in price from $15 to $40. Founded in 1939 by Margot Rosenthal, A & M Rosenthal, now The Dessy Group, got its start designing bridal veils and attendants headpieces. In the 1950's, Margot's daughter Ronnie and her husband Andrew took over the business and added bridesmaid dresses to the Dessy line. Today, the business continues to thrive under the leadership of Alan Dessy and design direction of Vivian Dessy Diamond. Pantone LLC, a wholly owned subsidiary of X-Rite, Incorporated, has been the world's color authority for more than 45 years, providing design professionals with products and services for the colorful exploration and expression of creativity. Always a source for color inspiration, Pantone also offers paint and designer-inspired products and services for consumers. More information is available at www.pantone.com.